Motocaddy has made significant gains towards becoming more environmentally friendly, with the brand's Lithium only powered trolleys and ensuring that its packaging is 'polystyrene free'. 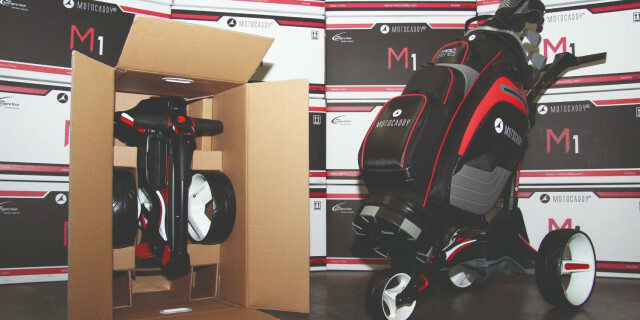 Along with leading the way in Lithium, Motocaddy has invested heavily in its boxes, with new polystyrene-free packaging being rolled out across the range. Futher enhancing its green credentials, the cardboard used to hold the trolley in place for storage and transportation is 100% recyclable, with the company delivering further environmental savings in every area, from the trolley production process all the way to operating on the course. For more information on all Motocaddy trolleys, bags, batteries and accessories, please visit www.motocaddy.com. You can also follow all the latest news on our social media channels @MotocaddyGolf on Twitter and @Motocaddy on Facebook.